Minimize. Minimise the current items to the Dock. Minimize All. Minimise all Tinderbox windows to the Dock. Zoom. Toggle zoom state (normal/full width) of the current window. Hold Option key to see alternate menu item: Zoom All. Toggle zoom state (normal/full width) of all Tinderbox windows. Enter/Exit Full Screen. Toggles the (current) screen into/out of full screen mode. Show Previous Tab. Selects the previous (to left) document tab. OS 10.12+ only, greyed out when only single document open. Show Next Tab. Selects the next (to right) document tab. OS 10.12+ only, greyed out when only single document open. Move Tab to New Window. Moves the current document tab into a new single-document window. OS 10.12+ only, greyed out when only single document open. Merge All Windows. Merges all open Tinderbox documents into a single window (i.e. single document tab bar). OS 10.12+ only, greyed out when only single document open. Inspector. Opens the Inspector window at the last used tab (default: Appearance Inspector, Interior sub-tab). Prototype Inspector. 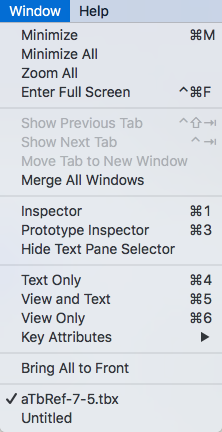 Opens the Properties Inspector window, with the Prototype sub-tab selected. Show/Hide Text Pane Selector. Toggles visibility of the Text pane's sub-tabs (default: panes are hidden). Text Only. Move window vertical divider so main view is hidden and the text pane fills the window. Focus automatically switches to the text pane. View and Text. Move window vertical divider so the main view and text pane are allotted equal space in the window. View Only. Move window vertical divider so text pane is hidden and the main view fills the window. Focus automatically switches to the view pane. Bring All to Front. Brings all Tinderbox windows to the front, i.e. on top of any other application's windows. Hold Option key to see alternate menu item: Arrange in Front. Brings all Tinderbox windows to the front, i.e. on top of any other application's windows, in a cascade of overlapping windows. [List of all open Tinderbox windows]. Brings the Tinderbox window whose title is clicked to the front of the Tinderbox windows.